Back in 2010 my eyes were firmly on a fatbike. In 2011, I purchased my first fatbike, a first generation 9:ZERO:7. After one year of riding and adventures, it was clear that it is not just a bike. It's an extension of my body and soul. But like with many things in life, it was just the beginning. This fall I was very excited and proud to partner with the cool guys from Alaska. In the fall of 2011, 9:ZERO:7 came with a new design for the frame and in addition to 135mm offset frame, they introduced a frame with 170mm symmetrical rear and new hubs too. As the 4.8" tires and 100mm rims are coming more popular, more room is needed for them. At the same time, the trend is of course for lighter setups as well. For 2014, 9:ZERO:7 is addressing all these needs, by introducing new 190mm aluminum frameset and 190mm Whiteout carbon frameset for the weight weenies! And of course, a new 135mm / 190mm hubset too. I have had my new aluminum 9:ZERO:7 for two weeks and it's time to take a technical look on the new rig. Versatility was the key with my first 907. My goal for this bike project is maximum floatation and lightness, emphasis being on the racing capabilities for races like Rovaniemi 150. The original plan was to choose SRAM XX1 11-speed system, but it's just way too expensive, hence ending up with 1x10-speed with a 11-36T cassette. But the great news is that a new company called OneUp Components is bringing an affordable alternative to XX1, by introducing 42T sprocket for most 10-speed cassettes. A sweet thing with a single front ring is the simplicity and silence of the drivetrain, and better Q-factor with 'normal' fatbike cranks. The color coding is pretty much the same as with the old bike, black-red-white, with some minor tweaks. The new 9:ZERO:7 hubs are sweet. They are constructed of cold forged aluminum, our hubs are assembled with a cold weather grease rated to -45°C / -50°F. There is plenty of clearance between the chain and tire, and also between chainstays and crankarms. No issues what so ever with the 10-speed drivetrain. I'm using pipeline brackets to mount the bottle cages (and Salsa Anything Cages too) to 9:ZERO:7 aluminum fork. Trusty bits covering the seatpost and saddle. Some nice details in there with the lovely Clown Shoe rims. The 4.8" tires are indeed massive! The trademark of 9:ZERO:7, snowflake. The weight of this setup is 14.18 kg / 31.26 lbs, significantly lighter than my old bike, 15.3 kg / 33.73 lbs. For racing, I will use a rackless system, consisting a Porcelain Rocket saddle pack and a dry bag on the handlebar. These will help further to reduce weight compared to the old setup. A couple of shots with the red brake hoses. The frame has all the braze-ons for versatile setups: eyelets for fenders, upper, lower, and dropout rear rack mounts, top-tube and seatstay guides for use with continuous shifter and brake housing and three water bottle bosses. And, the fork and frame are designed to accept 29er and 29+ wheelsets and tires! I did the recent Vajosuo Beer Ride with it and have done a couple of commutes too, and everything works great with this beautiful arctic machine. 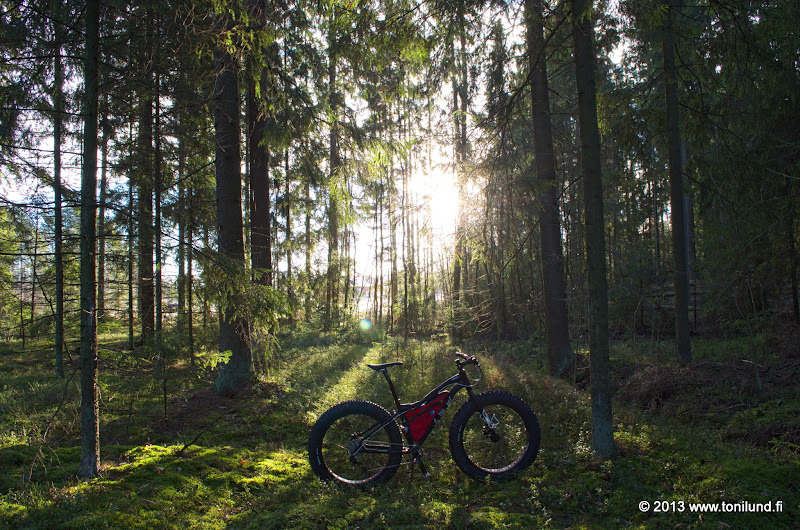 Vajosuo provided some very demanding technical terrain and I was suprised how fast and nimble the new 9:ZERO:7 is. The bottom line is that this bike lifts your feeling of freedom to a whole new level. And then there is the carbon frameset with 12mm/15mm thru-axles for ultimate lightness. 9:ZERO:7 has taken quantum leap forward in the fat universe with their next generation framesets. I want to thank 9:ZERO:7 for the new frameset and hubs. 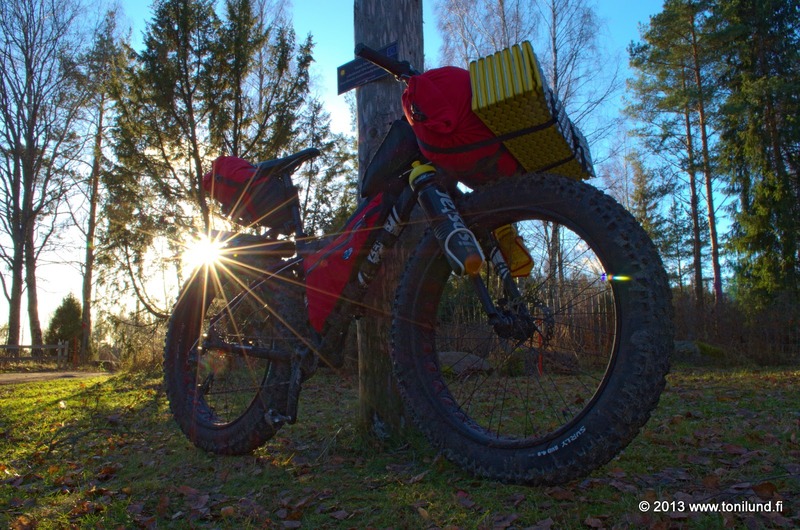 There is no doubt that this 'ultra fatbike' will help me in the Rovaniemi 150 2014 race! Also thanks to my local bike shop Pyöristi and Jan for building the wheels and helping me with the build! The next special report will feature the new Lumicycle Explorer lights. Stay tuned. 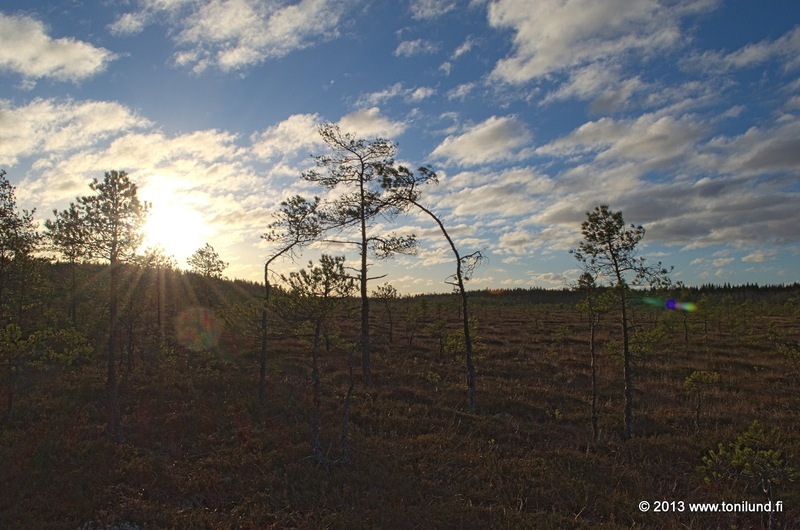 It's November, and the winter is not yet here in Southern Finland. But one thing is sure in November, and it's the Vajosuo Beer Ride. I did it last year for the first time. For those who doesn't know, the idea is to ride on the mires of National Park of Kurjenrahka, camp overnight at the Vajosuo shelter with good food and beers, and ride again the next day back to starting point. Last year I rode directly from home to Vajosuo shelter, but this time I would ride the Saturday evening section too. 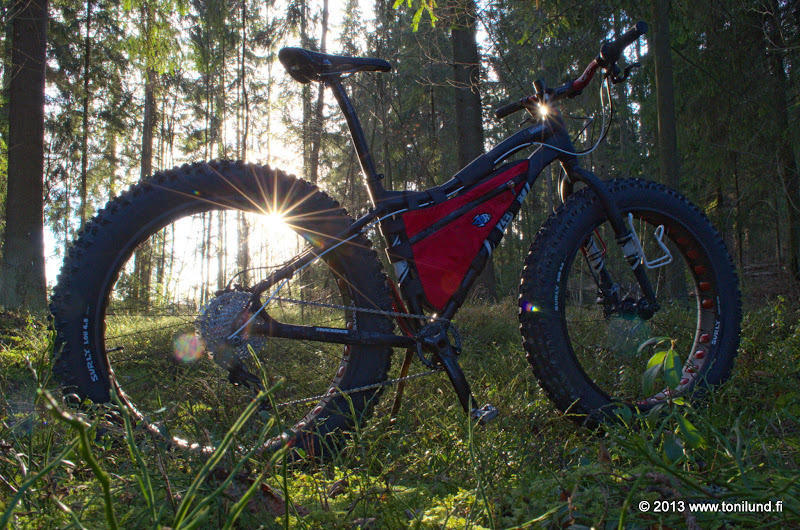 To make it even more special, I would ride with the new 9:ZERO:7 190mm fatbike and Lumicycle Explorer lights. My original plan was to ride from home to Lake Savojärvi (the starting point), but I decided to play safe because of a slight flu. The weather was almost exceptionally good, with clear skies, +5°C temperature and a full moon. But prior to the event we have had lots of rain, so the route would be very wet and slippery. The athmosphere around Lake Savojärvi under full moon was absolutely stunning! The duckboards were indeed very slippery, and even icy in many places. I managed to fall a couple of times but without any bad consequences. I had forgotten my helmet and therefore the other Lumicycle Explorer light at home, so it would be have been easier in the darkness with the helmet light, but even the one light on the handlebar was very bright. Without any doubt, this route is probably the most extreme I have ever encountered. It's very demanding and without my fatbike it would be complete nightmare for me. The new bike worked really well on the challenging terrain. I had RunKeeper tracking my progress, and the route took 13.36 km / 2h22min to complete. There were two casualties who were escorted back to starting point. At the Vajosuo shelter, the campfire was immediately started by Juha, the father of the Beer Ride. Juha preparing a delicious looking pasta sauce. My choice was pork chop with potatoes. The mood at the shelter with the fire was great. Traditionally, we visited the bird watching tower around 2AM. At this point, the wind had picked up considerably. In the morning, the usual breakfast chores. I was not the only one riding a new bike. Peter had his new Salsa Mukluk. At the Vajosuo. This is definitely one of my favourite places. My new 45NRTH Fasterkatt shoes survived the water torture test very well. A short stop at the Käärmelähde (translates as Snake Spring). The new 9:ZERO:7 was absolutely mindblowing. Only my flu made the riding feel pretty hard. Another short stop at the Laaskorpi shelter. Back at the Lake Savojärvi, after 25.74 km / 2h27min. We took a shortcut at the end and Juha completed the entire return route alone. Thanks to all participants, it was a great time again! Tommi's great shots are here.